Look at the fun we get to have at Bedecked and Beadazzled. A customer calls and says they want to stitch a canvas from our collection and we get to pull the threads and the stitches! How fun is that? 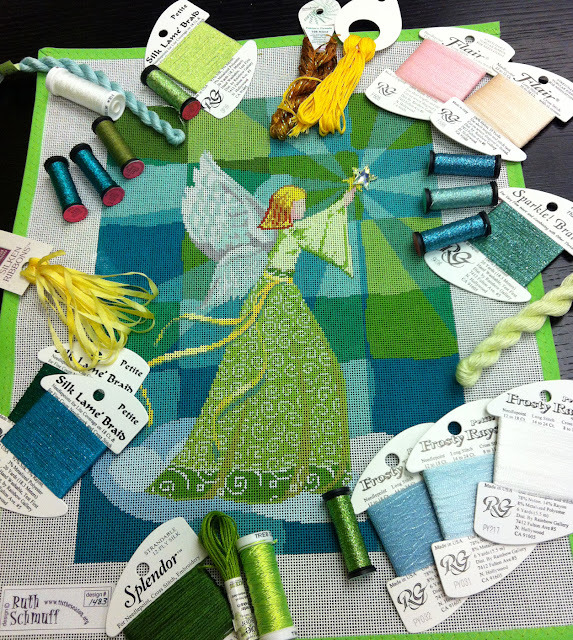 Underneath this yummy pile of threads and the big sparkly swarovski star is one of my newest canvases – the stained glass angel. We used lots of fine metallics in the background to make is glow and look like the angel is floating on her cloud in front of the Of course it’s an open stitch. The angel is the star of the show stitched in silk with a real ribbon sash. « Previous: Too much detail! I have been admiring this canvas on your website. I'll bet she's going to be gorgeous! I hope you can post a picture when the customer finishes the piece.